I drove a tiring but trouble-free route from our home in Oklahoma to Monticello, Utah, and was up before dawn the next morning. 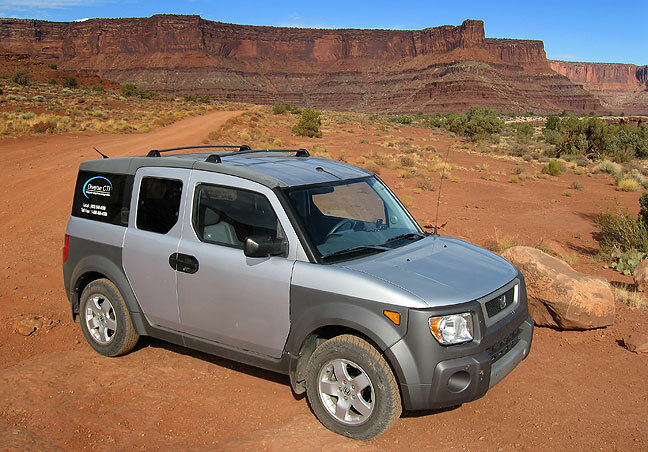 Michael was good enough to lend me his Honda Element all-wheel-drive, which he and I took on a trip in 2004. 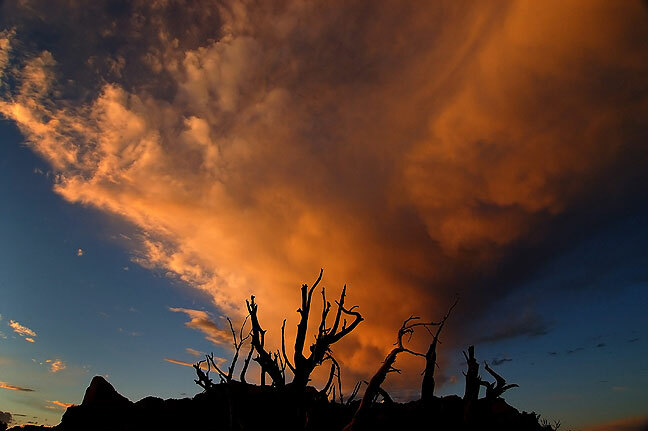 The sky takes on pre-sunrise light along U. S. 191 south of Moab, Utah. 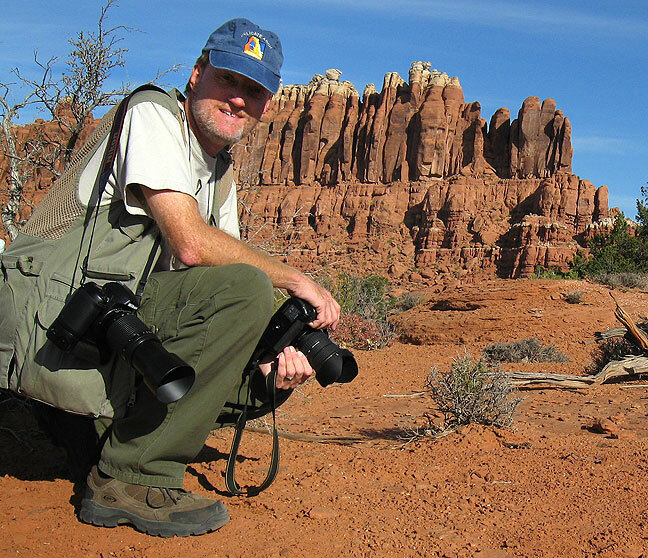 After shooting a couple of sunrise images along U. S. 191 south of Moab, my first venue was the Klondike Bluffs at Arches National Park. It was an excellent hike with clear skies, though it was a bit on the warm side. 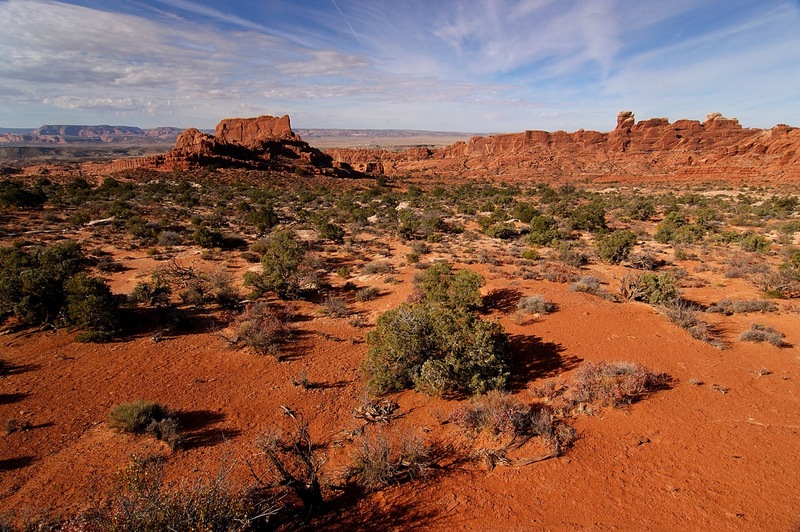 This overview looks west from near the Klondike Bluffs trail head at Arches. 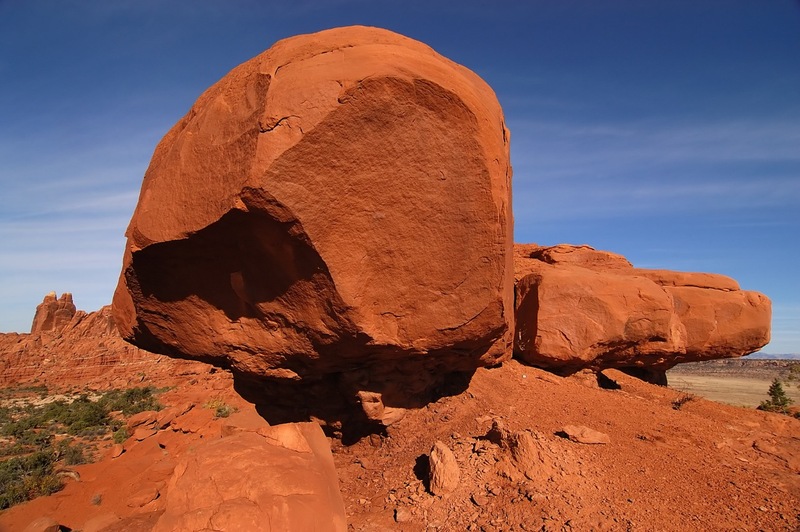 Giant deep-red sandstone boulders lead the way down the Klondike Bluffs trail at Arches. 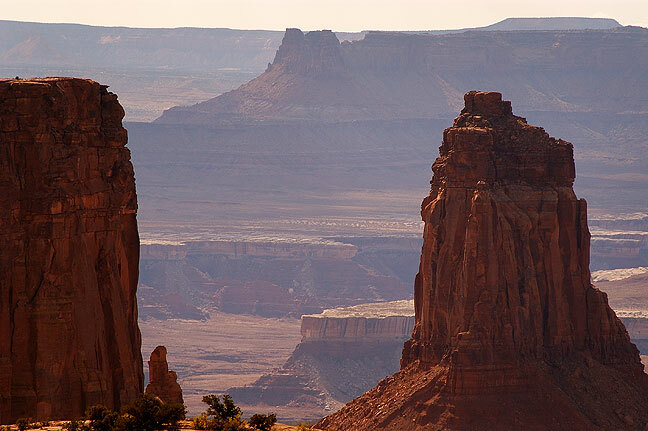 The La Sal Mountains and Turret Arch, viewed from the Klondike Bluffs section of Arches National Park, Utah. The Marching Men, Klondike Bluffs section of Arches National Park. Klondike Bluffs, Arches National Park. The Marching Men, Klondike Bluffs, Arches National Park. Dune field near Tower Arch, Klondike Bluffs, Arches National Park. 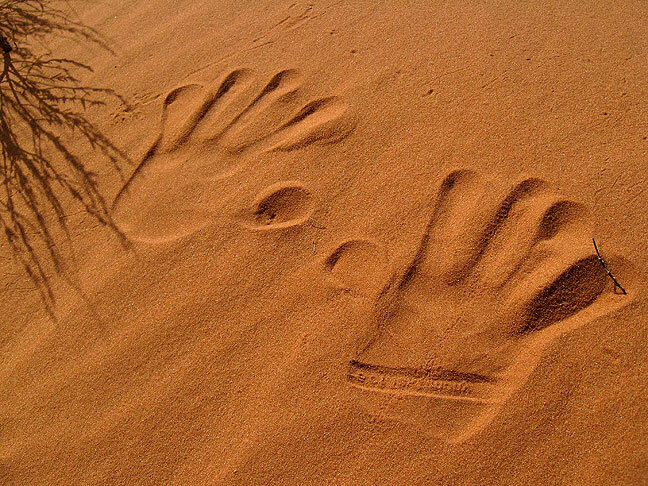 Hand prints are visible in a sand dune at Klondike Bluffs. Eroded stone face near Tower Arch, Klondike Bluffs, Arches National Park. Tower Arch, Klondike Bluffs, Arches National Park. 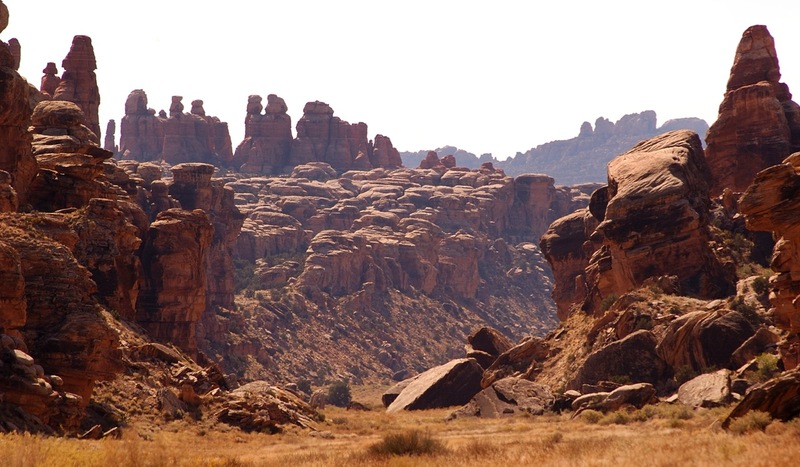 Looking south, Klondike Bluffs area, Arches National Park. Tower Arch on the right and surroundings, Klondike Bluffs, Arches National Park. I made the short hike in the Windows section at Arches that the park service calls a “primitive” trail, but it is practically a sidewalk. 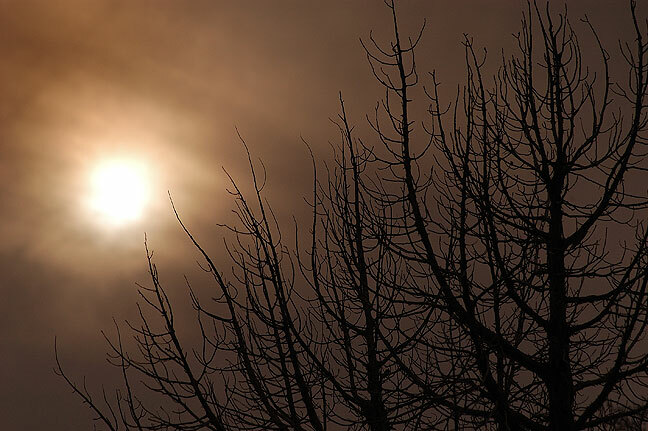 The day became increasingly hazy. I was looking for a natural arch called “Ribbon arch,” but could barely make it out, and didn’t photograph it. 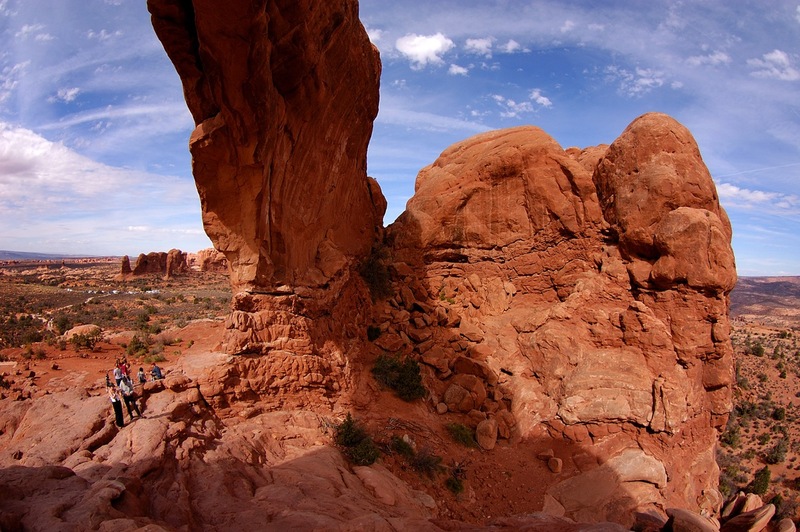 The “Primitive Loop” at Arches is far from primitive. I expect it was so named because of the touristy visitors. I drove to Hittle Bottom east of Moab and hiked the Richardson Amphitheater Loop Trail, which was interesting and fairly un-crowded. I visited the historic Dewey Bridge, which burned in April, and photographed the ruins. 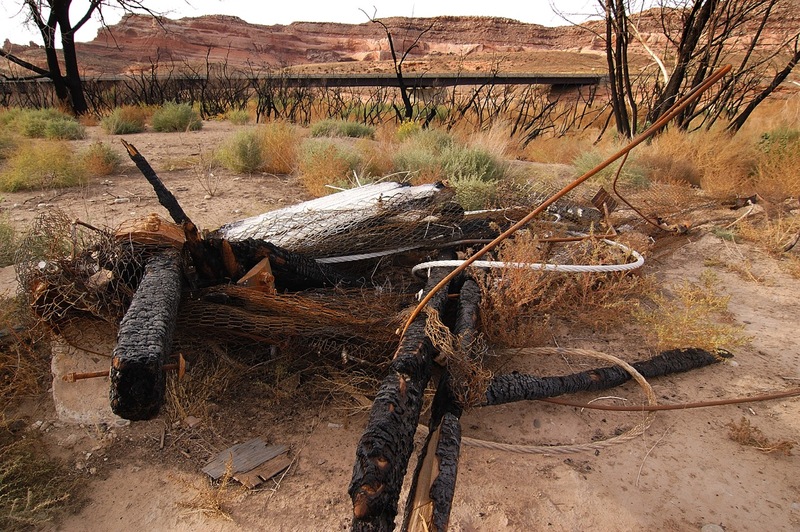 The 92-year-old Dewey bridge across the Colorado River near Moab was destroyed by a fire that began with a boy playing with matches in April 2008. I made my way to the Castle Valley for sunset, but only shot a few frames as the sun only came out in the last few minutes. Sunlight catches the mesa tops in Castle Valley. 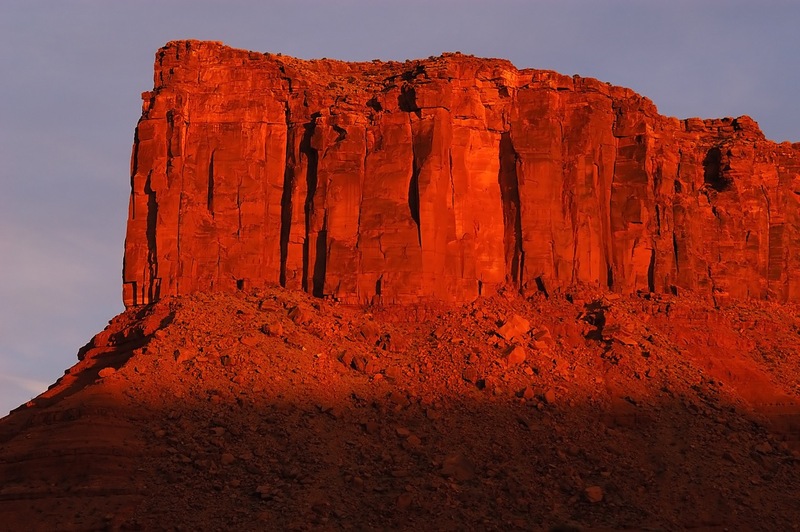 Wingate sandstone in Castle Valley takes in last light. 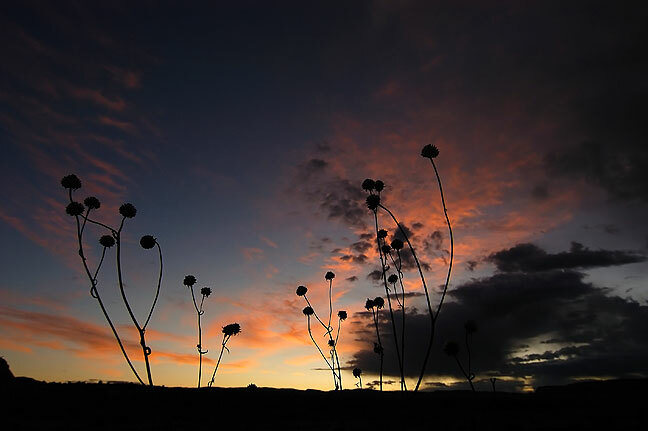 Last light fills the shape created by the canyon of the Colorado River. At first light, I drove to the Gemini Twin Bridges. The road was rough but otherwise unchallenging. 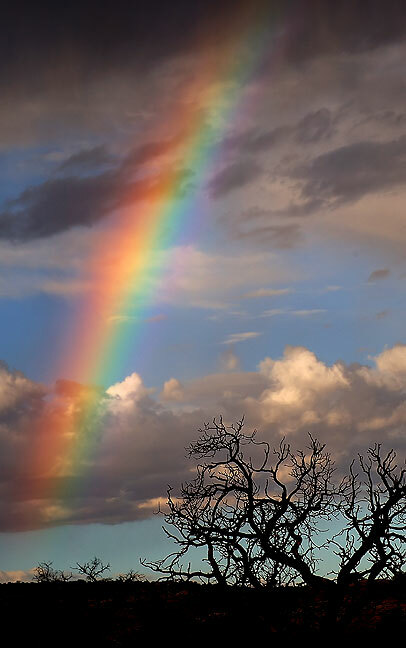 A rainbow emerges in morning virga at Gemini Bridges near Moab, Utah. 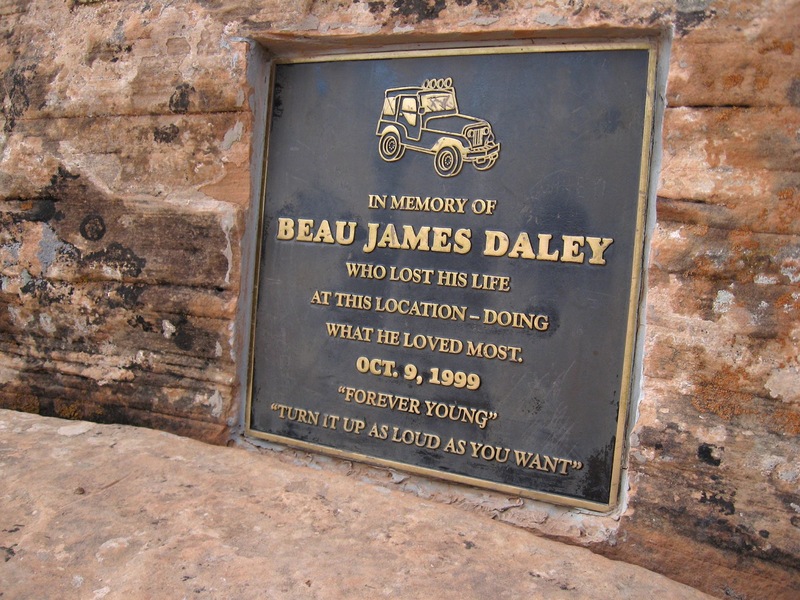 A bronze plaque is embedded in the rock at Gemini Bridges, where Beau James Daley died Jeeping there in 1999. 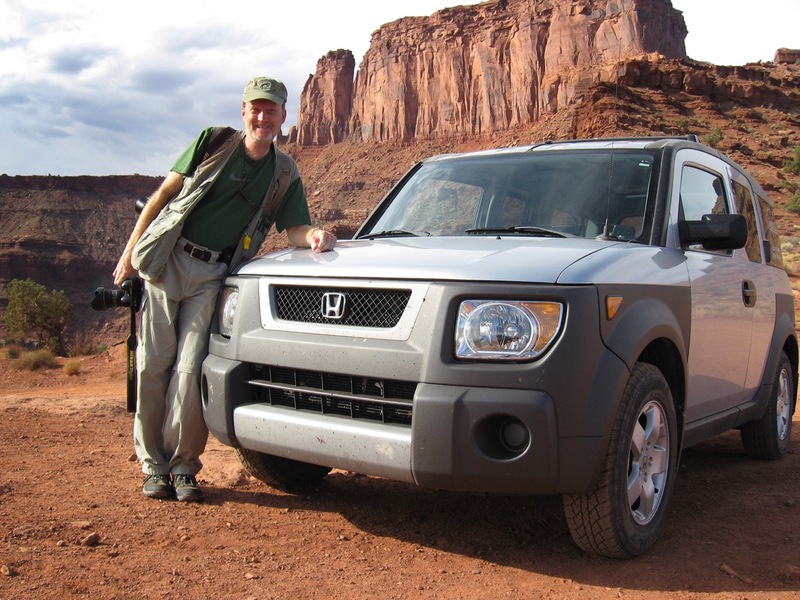 The author poses with Michael’s Honda Element on the White Rim Road. 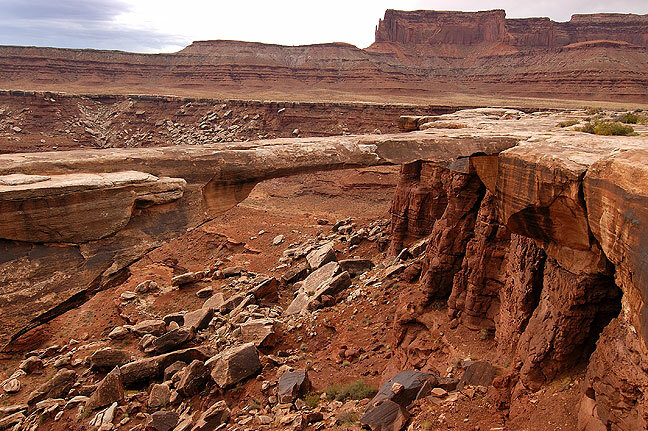 On advice from a park ranger, I drove the White Rim Road down to the Gooseneck Trail and Musselman Arch. A sign at the top says “Speed Limit 15 mph,” but is entirely superfluous, since there is no way to go any faster. Michael’s Honda Element was better than a passenger car, but but no means a high-clearance vehicle. View across the Colorado River looking east from the White Rim Road, Canyonlands. The La Sal Mountains are visible in the distance. View across the Colorado River looking east from the White Rim Road, Canyonlands, with Dead Horse Point in the upper left hand side of the frame. View across the Colorado River looking east from the White Rim Road, Canyonlands, with Dead Horse Point at the top of the frame. 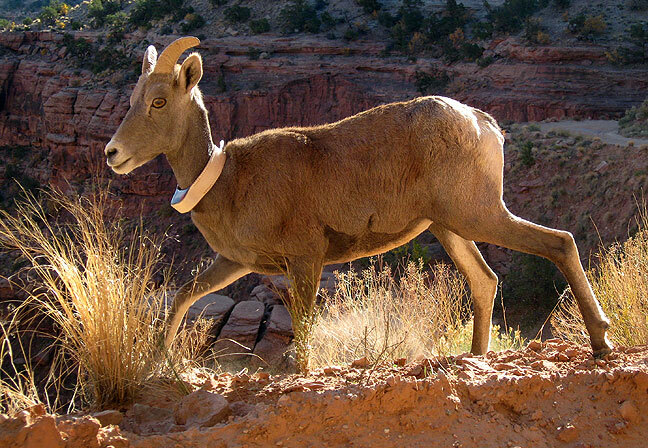 I spotted a Bighorn Sheep with a radio collar on the White Rim Road. The road was particularly rough and slow near Musselman Arch. 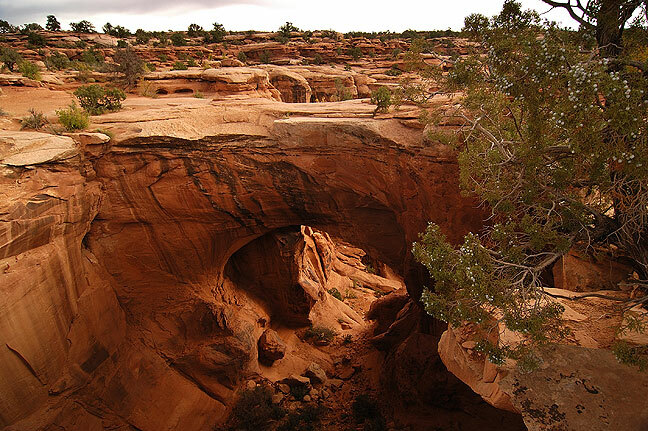 Musselman Arch is on the White Rim Road in the Island in the Sky district at Canyonlands National Park. Though quite impressive in person, it is hard to photograph it because it is difficult to get below it to see sky through it, and it was a grey day. I hiked the Wilhite Trail from the trail head to the point at which it descends to the Holman Spring Basin below, about 1.1 miles. I saw no one else. 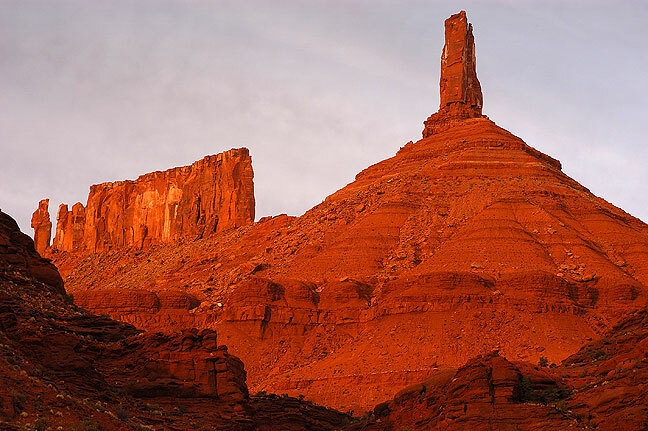 Candlestick Tower is visible from the Wilhite Trail at Island in the Sky district of Canyonlands. 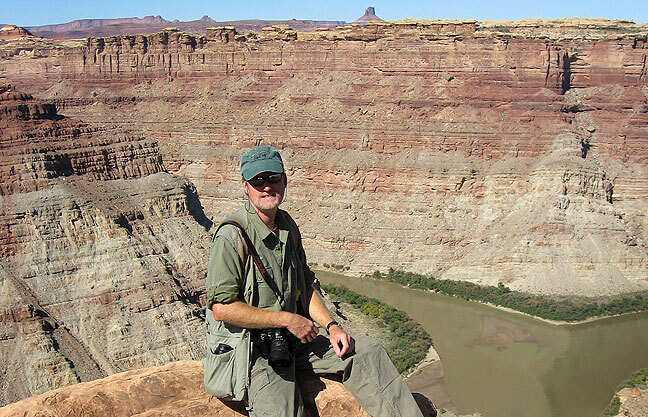 I re-hiked the Upheaval Dome Overlook Trail, which Michael and I had done in 2004. It was a better, more interesting trail than I remembered, possibly because this late afternoon light was better this time. 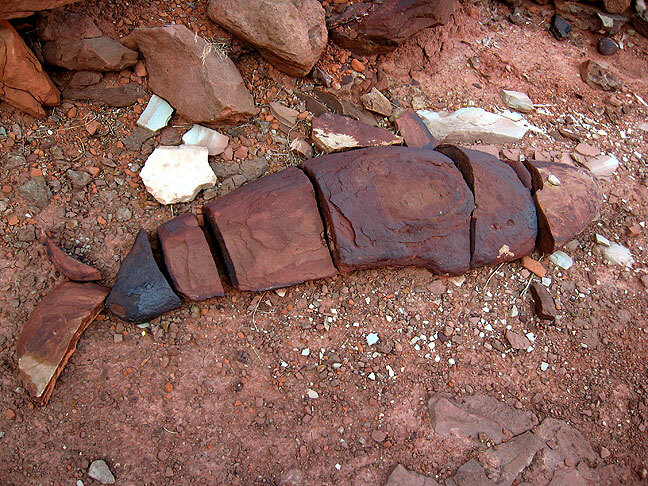 Vast canyons of Wingate sandstone are visible from the Upheaval Dome trail. 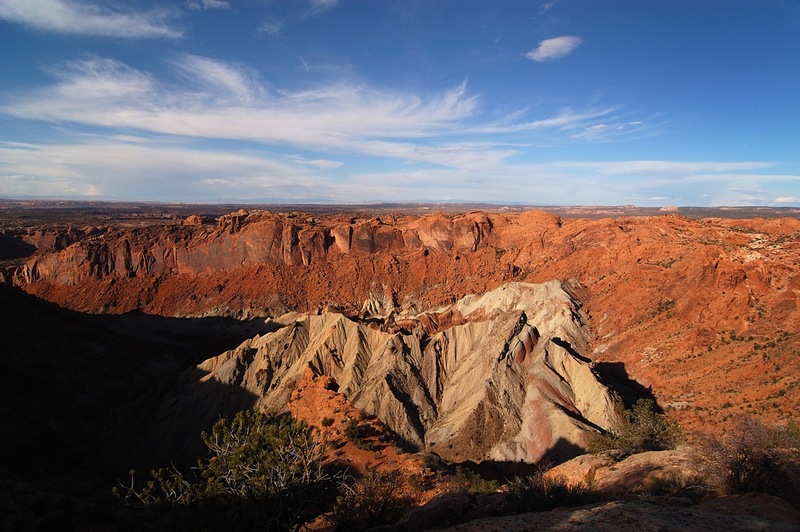 This is the Upheaval Dome. There is a long, primitive and indistinct trail that goes around it and down into it that I would love to hike one day. I made a point to be at the Green River Overlook for sunset, simply because I had not been there for sunset before. Despite a small crowd, it made really nice pictures. Golden sunlight gathers on the rims above the Green River at sunset. Chipmunk at the Green River Overlook, Island in the Sky district, Canyonlands. Sunset at the Green River Overlook, Canyonlands. 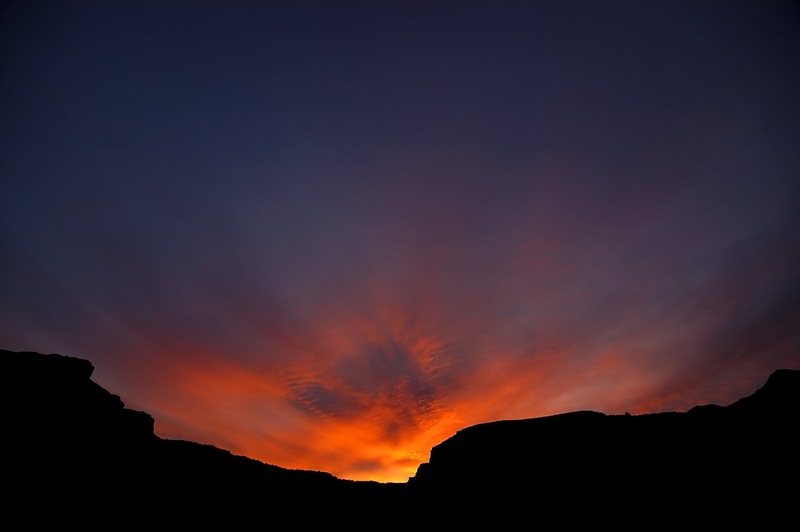 Sunset at the Green River Overlook, Canyonlands; this is one of my all-time favorite images of the southwest. Your host poses at the end of the Confluence Overlook at Canyonlands. I spent the entire day hiking the Confluence Overlook Trail in the Needles District at Canyonlands. A 6-mile trail that crosses three canyons, this journey sported excellent variety and beautiful scenery. The overlook itself was much more spectacular than I imagined it would be. On the Confluence Overlook trail, Needles district, Canyonlands National Park, Utah. Confluence of the Green River and Colorado River, Needles district, Canyonlands National Park, Utah. This view looks south into Cyclone Canyon from the intersection with the Overlook trail. This is another view from the intersection of the Confluence Overlook trail and Cyclone Canyon. A short stretch of the Confluence Overlook trail follows a Jeep road. This tree on the Confluence Overlook trail appears to have burned, possibly due to a lightning strike. Tree and sun, Confluence Overlook trail, Canyonlands. Near the Confluence Overlook trail head, Canyonlands. After this hike, I consider the Confluence Overlook trail one of my favorites. I made the long, excellent hike in a cold wind down the Alcove Spring Trail to the Zeus and Moses formations on the northern most end of Canyonlands. 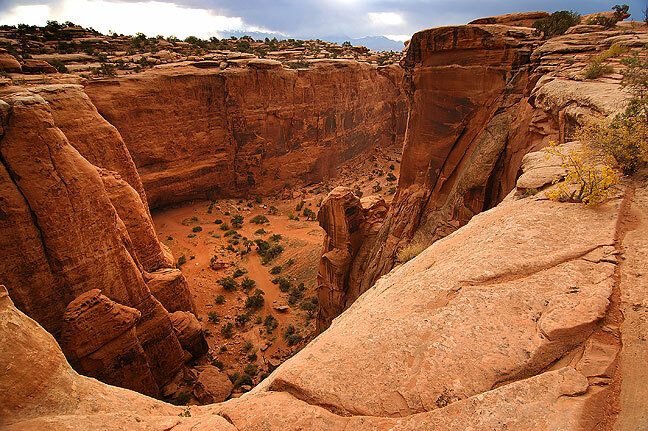 Alcove Spring trail, Canyonlands National Park, Utah; the cave on the left is the trail’s namesake. 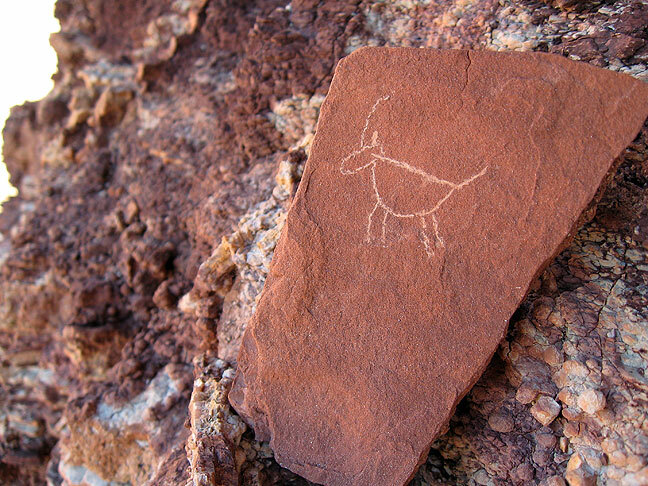 I found this modern petroglyph on a stone on the Alcove Spring trail. Unlike graffiti etched on a boulder or stone face, this was etched onto a small stone, which I felt had a sense of humor attached to it. 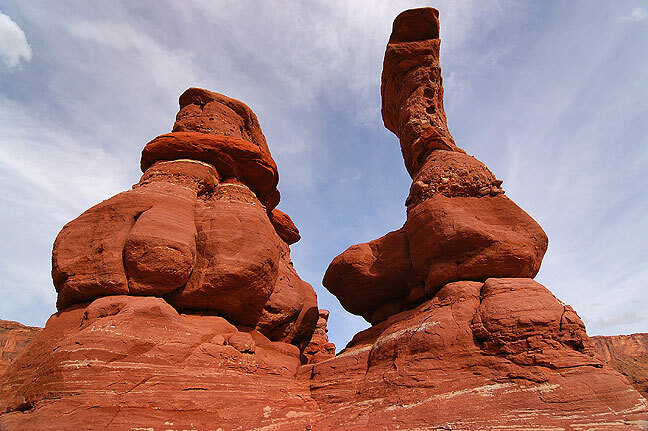 Zeus and Moses formations at the end of the Alcove Spring trail, Canyonlands. Along the Zeus and Moses loop, Canyonlands. 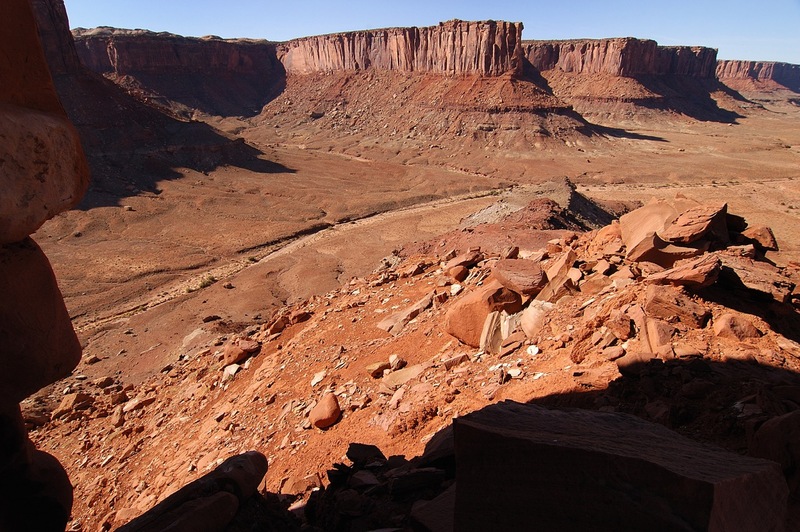 The view up Taylor Canyon, Canyonlands. This view looks southwest: west down Taylor Canyon to the right, and south up Trail Canyon to the left, from the Zeus and Moses formation. Along the Alcove Spring trail, Canyonlands. 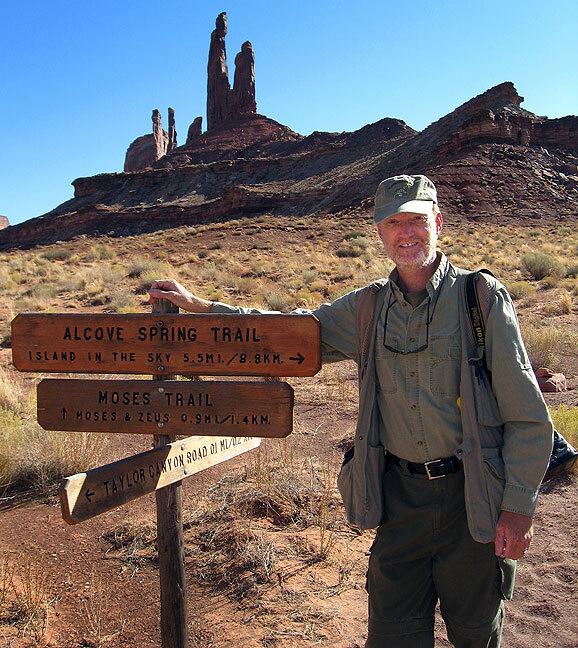 Your host poses at the Zeus and Moses loop trail head at the end of the 5.1-mile Alcove Spring trail, Canyonlands. Near the end of the day, I took the White Rim Overlook trail. I first hiked this trail in 2002. It was an excellent day of hiking to conclude this trip. 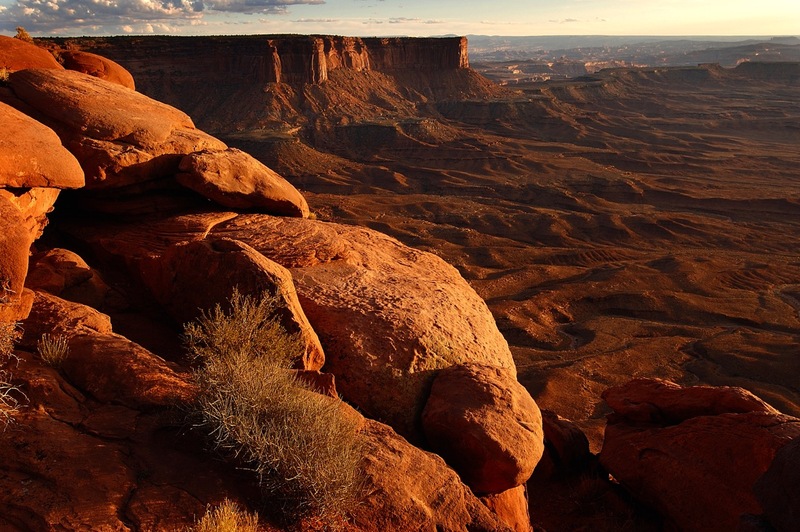 View from the White Rim Overlook, Canyonlands. 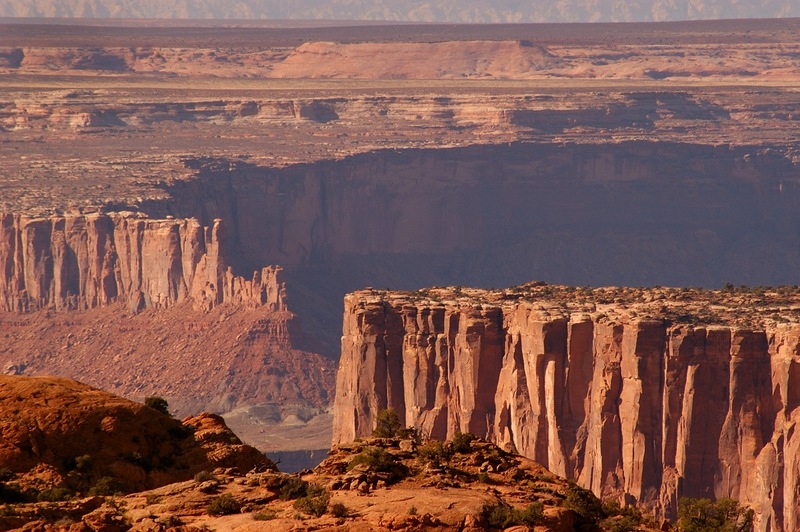 Monument Basin viewed from the White Rim Overlook, Canyonlands. 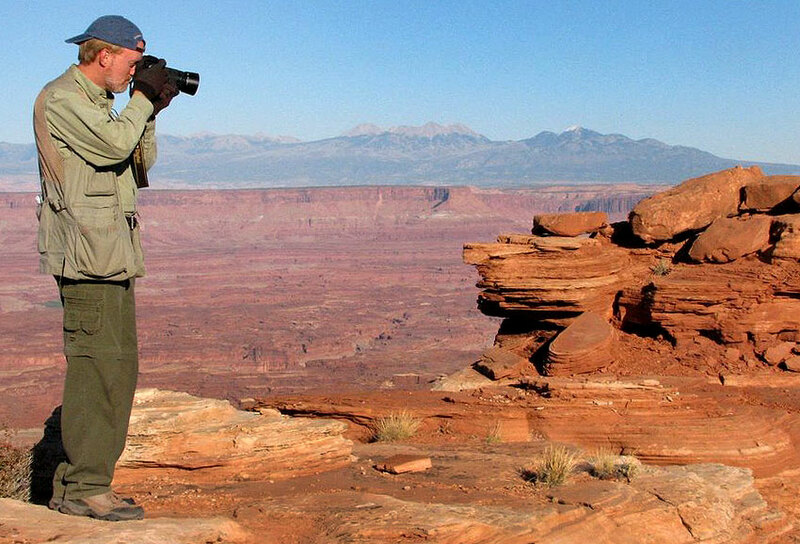 You host makes pictures at the White Rim Overlook in Canyonlands National Park. View looking east from Gooseberry trail head, Island in the Sky district, Canyonlands. 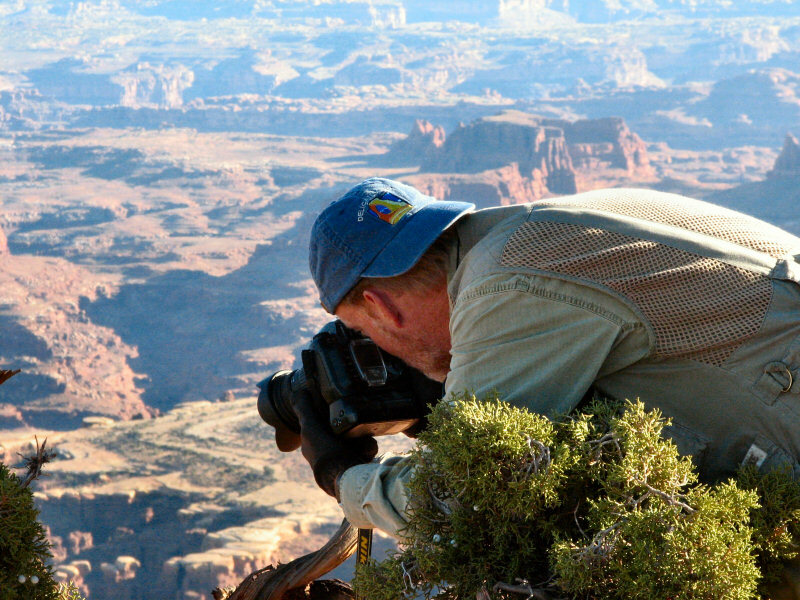 The author prowls around the White Rim Overlook trail to get an image. View looking north from Gooseberry trail head, Island in the Sky district, Canyonlands. 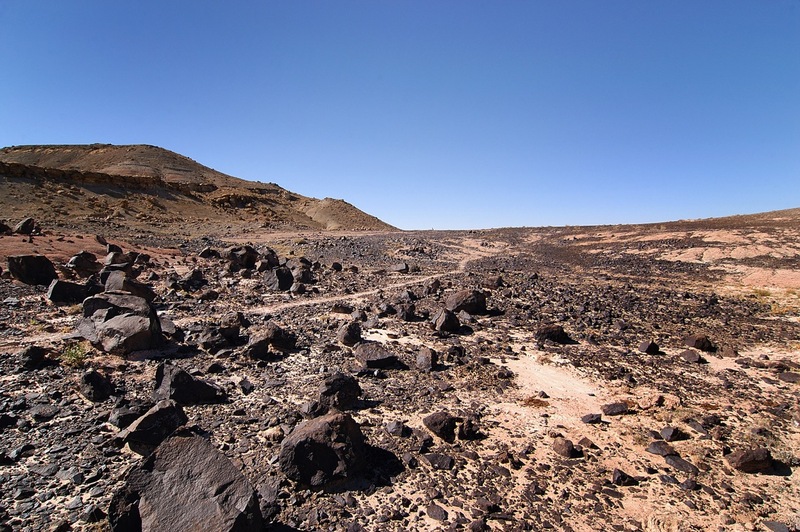 The author tries to negotiate the intricacies of hiking in the desert. Looking south from the Gooseberry trail head. On the drive home, I made a few images un southern Utah, and also stopped to photograph Shiprock Peak, since it was along my route. Desert loneliness is punctuated by a perfect blue sky on an empty stretch of highway near the Utah-Colorado border. 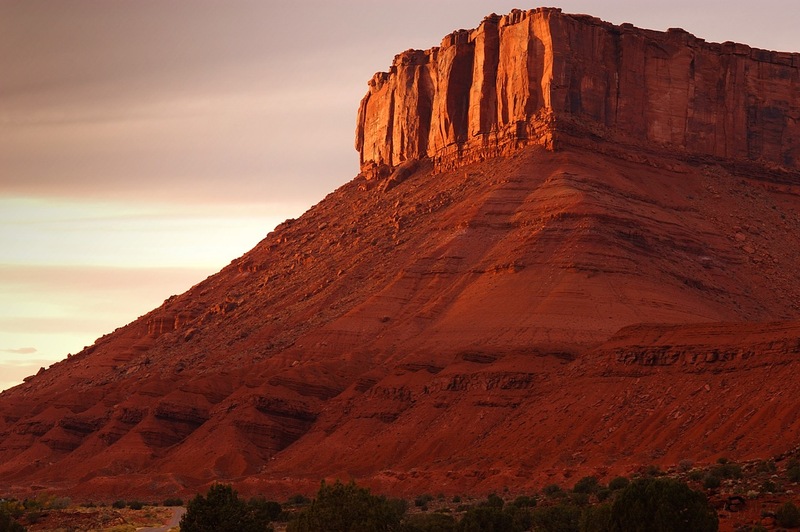 Afternoon, Shiprock Peak, New Mexico. Barbed wire and Shiprock Peak, New Mexico. 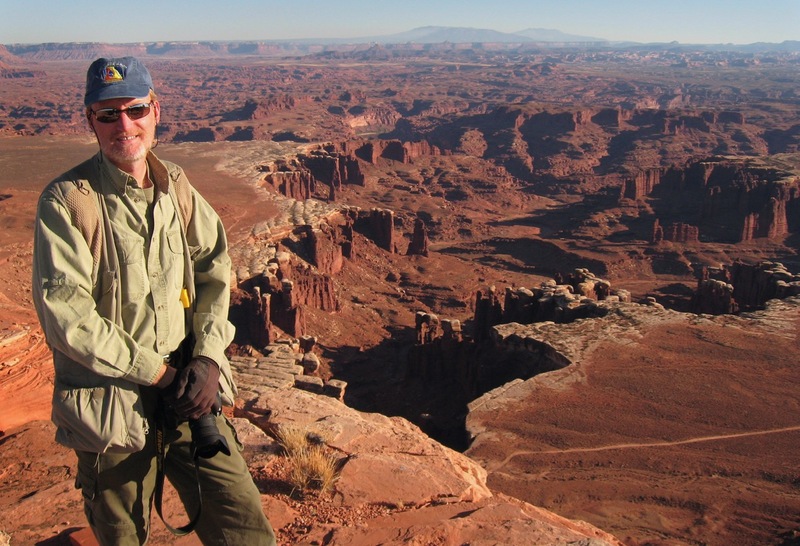 The author poses at the end of the excellent White Rim Overlook trail at Canyonlands National Park. 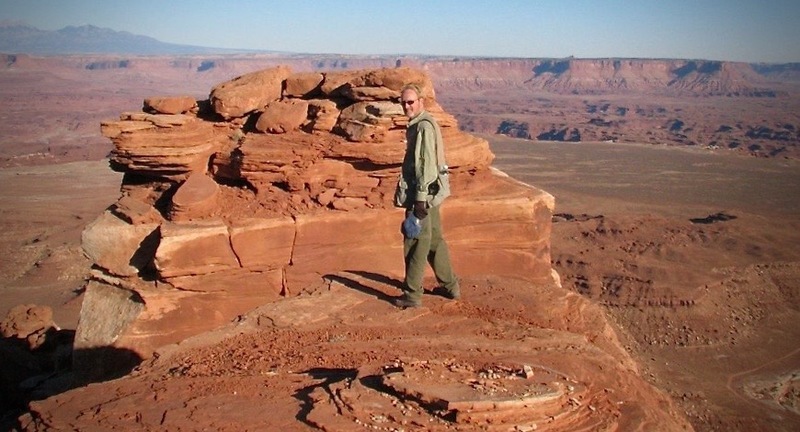 I’m off to Moab next week and I was searching for some ideas of what to do. Your narrative and especially your photos have really made me excited to get there. Thanks for putting them online.